I've always loved Korean food, but have never really tried to cook it before. Until today. I found this recipe for bulgogi in the newspaper the other day, and despite the fact that I couldn't locate any accompanying kim chee, thought it turned out remarkably well. And it was super-duper easy. I did end up making more marinade, as I thought it looked a bit skimpy, so next time I would probably just double it right from the start. I would also tweak a couple of other things next time - a little more heat, maybe thicken the sauce a bit - but generally give this recipe a big thumbs up. Freeze the beef for 20 minutes, slice across the grain into 1/8 inch thick strips. Whisk together the sauce ingredients. (I couldn't find chili oil so doubled the sesame oil and added a tsp or so of Chinese chili paste instead). Toss the onions and pepper with half the marinade. 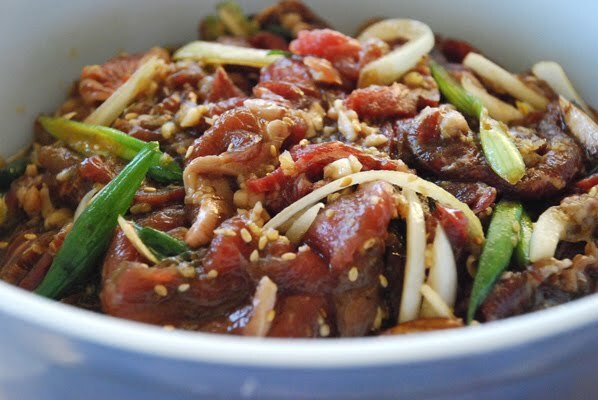 In a separate bowl, marinate the beef with the remaining sauce, for at least 15 minutes. Heat 2 tsp vegetable oil in large saucepan over medium-high heat. Cook the onions and pepper until softened and nicely charred, ~ 5 minutes. Remove to a bowl or something. Heat another 2 tsp oil over high heat. Add half the meat, turning often until browned, ~ 2 minutes. Remove and cook the rest of the meat. Return the first batch, the onions and pepper, and any accumulated juices to the saucepan and cook, tossing, until heated through. The recipe in the paper called for this to be served rolled up in lettuce leaves, but I served it over big round Asian noodles and it was yummy. The house still smells insanely awesome. Color me impressed. I've yet to try any Korean food, but after seeing you conquer it, I might just now. It was really so dead easy, Dr M. And the spousal unit loved that there was lots of meat involved. The Riders won! My Mean Green Machine will be seeing your Stamps in a week. I love when cooking invades the house. When it smells good, of course. I only wish burnt popcorn didn't linger so much. Never had bulgogi myself but by the looks of things I've really been missing out. I'll pass this recipe on the chef. I'll just tell the kid its B-R-A-I-N-S! How is this dish pronounced? Word Verification- rumbl - the sound your tummy makes if your bulgogi was undercooked. I already have supper on the go - but that recipe sounds delicious! And fried fish. That hangs around way too long as well, Al. Your familial unit will love it, I expect, Sean, particularly the beef lover. So good, so easy, Kathy. You could make this with both hands tied behind your back. If you wanted to. Yum!...too bad you can't send food by comment box eh? I'd love to try a sample of that. There's a little bit left over too, Mr Anchovy, just enough to fit into this comment box for you.